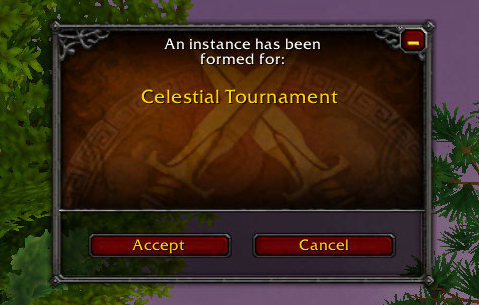 The Celestial Tournament will be a new event held on the Timeless Isle in the upcoming 5.4 patch. There will be new pets to collect, battles to fight, and even vanity items for your vanity pets! Ready to put your pets and your ability as a Trainer to the ultimate test? Hopefully the Celestial Tournament will prove to be a fun challenge for you! An NPC located at The Celestial Court, Master Li, will provide you with a weekly quest, and will also place you into a solo-queue to enter the Celestial Tournament scenario. Upon entering the scenario you'll be transported into an instanced version of the zone, however exploration of the area is mainly limited to the main courtyard. Don't let that get you down, though, because that's where all the action takes place! The scenario is made up of two phases, with a total of seven battles. In phase one, you must defeat three NPC opponents and their legendary pet teams, while phase two will have four single legendary pets you must triumph over. Seems pretty straight forward, so what makes this event a unique challenge? While in the scenario, you will not be allowed heal or revive any of your pets. To heal your pets, you must leave the event, however this resets your battling progress if you haven't completed the scenario objectives. So pick your teams wisely and use all of your pet battling knowledge and skill to complete the weekly quest. The weekly quest will reward a new type of currency, Celestial Coins, and players will be able to use them to purchase four new celestial pets. Each one is a smaller (and cuter!) version of their larger counterparts, and will cost 3 coins each. Players can earn one coin per week, however completing the quest for the first time will unlock a one time quest, The Rainy Day is Here, which rewards two coins. Just think, we'll be able to earn a new pet after just the first week of completing the Celestial Tournament scenario! The Timeless Isle is not only for battlers seeking a challenge. Similar to the "Lil' Gear" idea in our 2012 April Fool's gag, collectors might be able to purchase items to properly pamper their Perky Pugs. A rare spawn vendor NPC named Whizzig will occasionally appear for a short period of time at various spots on the perimeter of The Celestial Court. 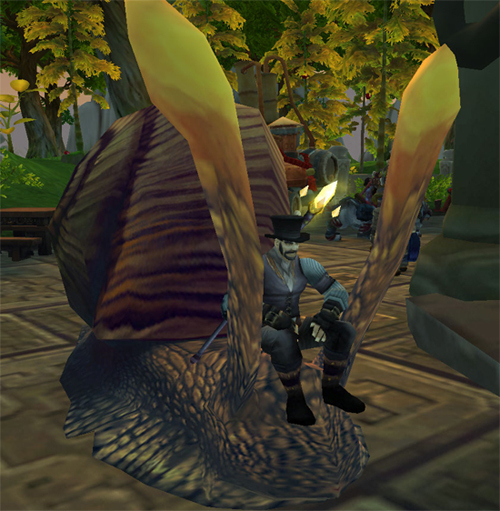 He's a dapper looking fellow riding on top of a giant snail; be on the look out! Whizzig sells four unique items that should fit just right on a playful pup, as well as some Pet Biscuits. Each item costs 500 Timeless Coins. These items seem to be unfinished still, so there aren't any previews of a Perky Pug in full costume yet. Just imagine how darling they'll look, though! The Timeless Isle is full of mystery and there are still many things yet to be discovered. In addition to the Celestial Tournament, it's possible that some new wild and rare spawn dropped pets may also turn up. 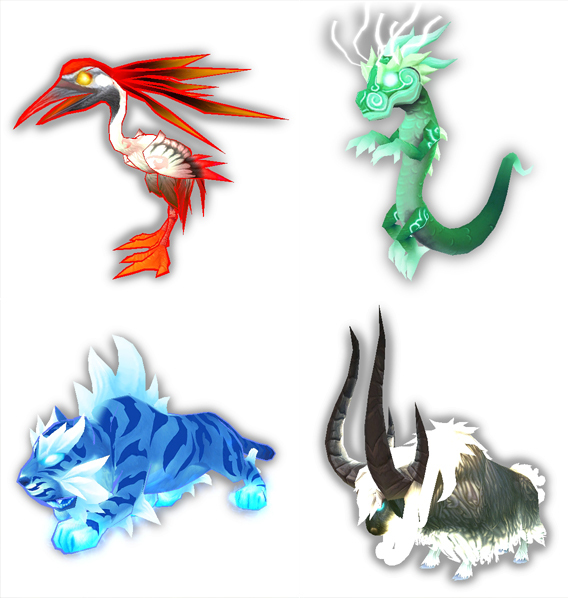 So get your pet collection ready and your adventuring boots on — the Timeless Isle awaits in 5.4! Can't wait for 5.4? The Celestial Tournament is currently open for testing on the PTR, so check it out and then leave some constructive feedback for the developers.